Second class back for Term 1 in 2016 at Stoccata Drummoyne, and I started introducing some new staples into the lessons. One of the biggest difficiencies I think we've had for the classes so far is lack of consistent practice of the basic foot work for each system. So for each system I've started to introduce a footwork form that we'll be practicing each week to cement this skill. I'm really happy with how the footwork forms were received, and after a couple of walk throughs I could see people becoming cleaner and more confident in their footwork. We'll keep doing these over the next couple of weeks, and hopefully people will learn them and we'll move through them at a much faster rate. We started with the Basic Bolognese Footwork Form, which I posted earlier today in all it's glory. The rest of the class was then taken up with the introduction of the Guardia di Faccia Clock Drill. We worked through the specific attacks and defences for the attack by thrust and attack into the low inside line. We'll work through the rest over the coming weeks. 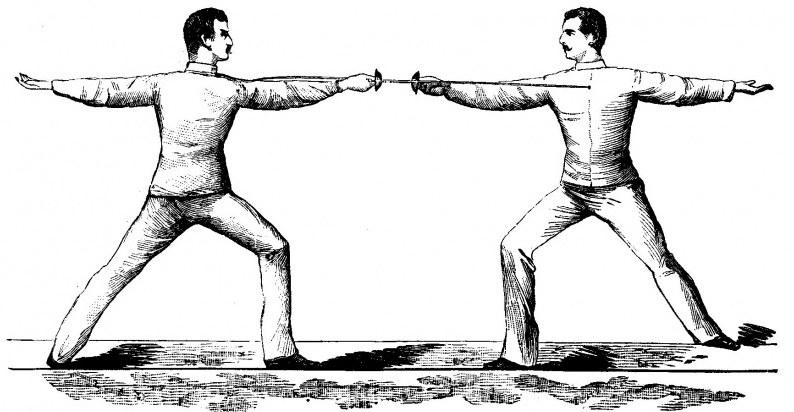 We started with the rapier footwork form developed by Guy Windsor's School or European Swordsmanship. The full details can be found on their curriculum wiki, which includes a video of Guy working through the form. We only did the first 3 steps of the form, but a lot of repetitions. We'll be building the rest of this form over the coming weeks. We then worked through some basic lunging drills, laying the foundation for rapier and dagger work later this term with the introduction of offhand hand checks. Direct thrust in response to partners invitation, working the high inside and high outside lines. Thrust by gain and glide in response to partner's point in line, working the high inside and high outside lines. Thrust with hand check in response to partner's point in line. Beginning in perfect measure, patient agent presents the point in line to the active agent's high inside line. Once the sword is found, the active agent then translates the torso forward to gain the sword. As they do this the offhand is extended forward near the sword hand turning the off hand into 1st (palm to outside). This places the offhand palm onto the debole of the patient agent's sword, creating the hand check. 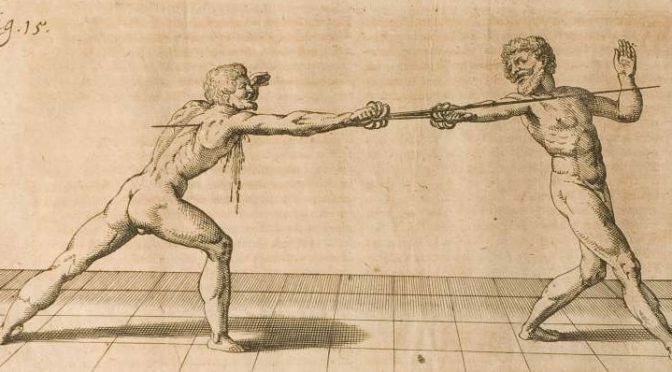 The active agent then makes a direct thrust with a lunge, gliding down the flat of the patient agent's sword with their offhand maintaining the handcheck preventing the patient agent's cavazione. The patient agent takes the hit, after which the active agent recovers back to perfect measure. These are the class notes for the Italian rapier class held at Stoccata Drummoyne on 14 Oct 2015. The change of engagement is the next action on the blade after the blade seizure. The purpose of the blade seizure is to quickly change the engagement so that when the opponent perceives the initial engagement, their reflexive response is defeated by this action on the blade. Instructor presents point in line (tip high). Student, from out of distance, extends the hand to engage the presented sword in 3rd on a step forward. Student changes engagement from 3rd to 4th and lunges to hit with a thrust by glide..
Instructor takes the hit, after which the student recovers back out of distance. Student, from out of distance, extends the hand to engage the presented sword in 4th on a step forward. Student changes engagement from 4th to 3rd and lunges to hit with a thrust by glide. Instructor presents point in line (tip low). Student, from out of distance, extends the hand to engage the presented sword in 2nd on a step forward. Student changes engagement from 2nd to low 4th and lunges to hit with a thrust by glide..
Student, from out of distance, extends the hand to engage the presented sword in low 4th on a step forward. Student changes engagement from low 4th to 2nd and lunges to hit with a thrust by glide.. The step forward as you engage the blade is not optional. The hand precedes the foot as always but the engagement and step must end at the same moment, thus the step is very quick to make this happen. The blade presentation is either with the tip just above the height of the extended hand, or just below. 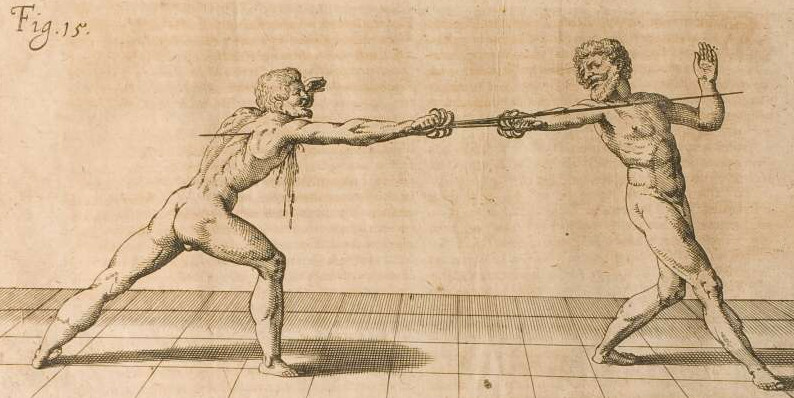 The threat should thus be either above or below the opponent's hand when they are in guard. The change of engagement must be subtle to prevent the opponent reacting during the change. These are the teaching notes for the Italian Rapier class held at Stoccata Drummoyne on 7 Oct 2015. Covering the line from out of measure, then using footwork to come into measure with a gain. The attack on the pass can be used as an alternative to the attack with a lunge. The primary advantage of using the pass is the increased measure at which the attack can be thrown. Since the action takes us to the outside of our opponent the action preceding the attack on the pass must pull the opponent’s sword to the high inside line. From Guardia Terza, feint a thrust to the opponent’s high inside line. As the opponent moves to parry 4th, cavazione clockwise, extending to hit to the stomach or chest and passing forward with the rear foot to deliver the thrust with the hand in 2nd. Repeat 5 times and then reverse roles. 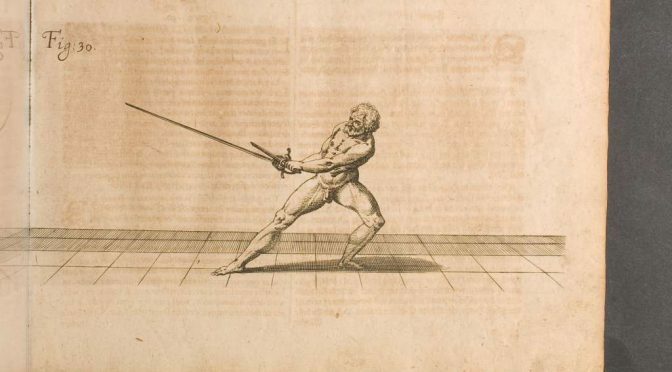 Note: The torso as it comes forwards leans over the now forward left leg, which pulls the torso to the side and away from the opponent’s sword. The attack on the pass relies on speed and the opponent being caught out of position. The technique used in the above drill does however leave the fencer susceptible to a counterattack in the high outside line. 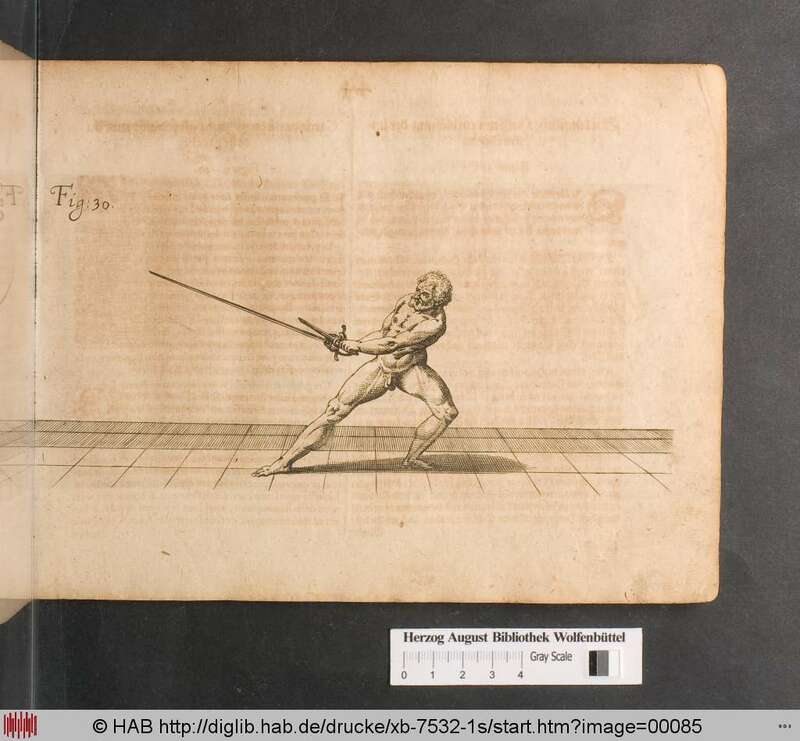 As you extend the sword to make the hit, simultaneously reach forward with the offhand, bringing the palm towards the opponent’s hilt or blade to prevent the counterattack in the high outside line. Opponent engages the sword in the high outside line. Cavazione counterclockwise to make a thrust feint to the high inside line. As the opponent moves to parry 4th, cavazione clockwise, extending to hit to the stomach or chest and passing forward with the rear foot to deliver the thrust with the hand in 2nd. Hand check to the high outside line with the offhand.